Radical Advice for Reinventing Talent and HR. Most executives today recognize the competitive advantage of human capital, and yet the talent practices their organizations use are stuck in the twentieth century. Typical talent-planning and HR processes are designed for predictable environments, traditional ways of getting work done, and organizations where "lines and boxes" still define how people are managed. As work and organizations have become more fluid--and business strategy is no longer about planning years ahead but about sensing and seizing new opportunities and adapting to a constantly changing environment--companies must deploy talent in new ways to remain competitive. Turning conventional views on their heads, talent and leadership experts Ram Charan, Dominic Barton, and Dennis Carey provide leaders with a new and different playbook for acquiring, managing, and deploying talent--for today's agile, digital, analytical, technologically driven strategic environment--and for creating the HR function that business needs. Filled with examples of forward-thinking companies that have adopted radical new approaches to talent (such as ADP, Amgen, BlackRock, Blackstone, Haier, ING, Marsh, Tata Communications, Telenor, and Volvo), as well as the juggernauts and the startups of Silicon Valley, this book shows leaders how to bring the rigor that they apply to financial capital to their human capital--elevating HR to the same level as finance in their organizations. 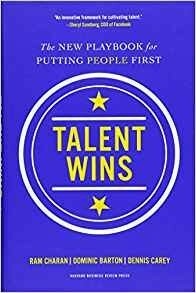 Providing deep, expert insight and advice for what needs to change and how to change it, this is the definitive book for reimagining and creating a talent-driven organization that wins.